Replay Music is a revolutionary new way to capture streaming music from the Internet or any external source into MP3 files or CD's. And it's really easy to use, too. Better tagging. Replay Music 5 identifies songs better and faster than Replay Music 4. Using a new database from Rovi, Replay Music is far more accurate. Plus, only about 90 seconds of a song are needed to get an accurate tag. Replay Music 5 now is able to tag songs in any language supported by Microsoft using the language's character set. For example if the song has a Japanese title it will tag it with Japanese characters. Updated the conversion process to convert quicker with less errors. The transferring process to the Windows Media Player library has been updated. Check Always tag with Genre name if you want to override Replay Music's genre lookup. 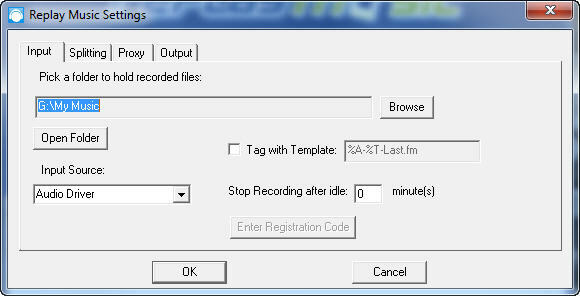 Pick a folder to hold recorded files: This is the folder where your MP3 recordings are saved. Actually, they are saved in a subfolder under this folder, with the same name as the album name. 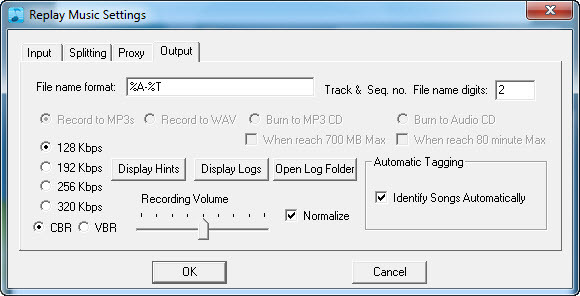 So, if this setting is "D:\Music", and the album you're recording is named "Eagles", then songs are saved in "D:\Eagles". Input Source: For most streaming recordings, use Audio Driver as the input source. 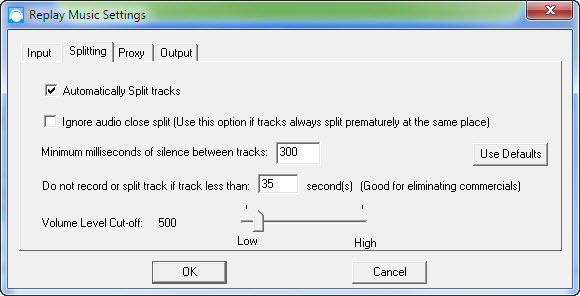 Windows 7 and Vista users who experience skipping or have trouble picking up an audio signal should select the Windows Audio Driver option (only available to Windows 7 and Vista users)..
Volume Level Cut-off: When Replay Music determines silence, it uses a minimum volume threshold for deciding what "silence" is. For example, if you're recording from a vinyl LP, there may be some detectable background noise. You can increase this value if recordings are not being split properly, if you think that some background noise is occurring. 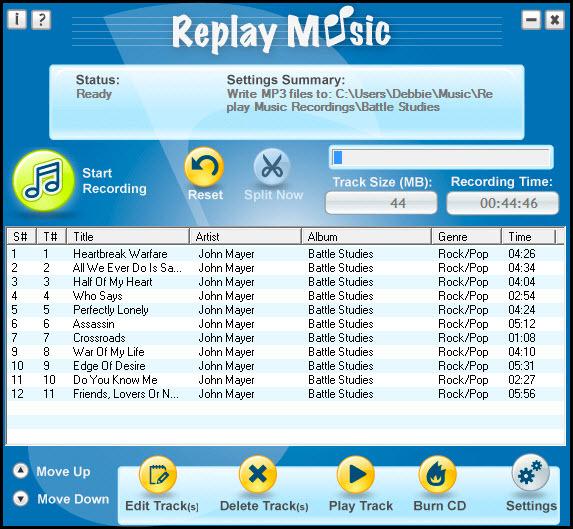 Replay Music can create MP3 files, or automatically burn CDs for you. CBR or VBR: CBR stands for Constant bitrate and VBR stands for Variable Bitrate. CBR is the older encoding method, so all MP3 players recognize this encoding method and a player can easily calculate the length of the MP3 recorded with this method. VBR is a newer encoding method so the recorded files will usually be smaller compared to CBR, but some players do not recognize this method and may have a hard time measuring the length of the MP3 recorded. Ctrl + Shift = Moves backward through the tabs in settings. Ctrl + Alt + N = Sort track number.